Choosing the best camping generator depends on a few key factors that we discuss in this article, such as: noise level, portability, power and features such as a spark arrestor. It’s essential that you consider all of the factors before making a buying decision which is why we wrote this practical buying guide on the best camping generators. We hope this will provide you with some practical advice to help you make an intelligent decision. Our goal is to make sure you spend your money wisely and get the best camping generator for your money. Do you remember the good old days when your family would take you camping at the weekend? Everyone would jump into the car on a Friday afternoon and you’d make your way to your favorite spot. When you look back on your childhood those weekends might be some of your favorite memories. One of those memories would have been cooking a tasty meal over an open fire, but those days are long gone. Technology has caught up with campers and now you’ll be able to take a portable generator into the woods with you to cook your food on grills. Ideal for camping, supplemental RV power. Quieter than a normal conversation and can also be run in parallel to double your power. Let’s look at some of the specific features campers will want to watch out for. When you’re in the middle of nature you finally have a chance to relax, so the last thing you need is a camping generator loud enough to spoil everything. If someone pitched their tent nearby and woke you up every day you wouldn’t be happy. Ideally you’ll want an inverter camping generator because they’re so quiet you almost can’t hear anything. All of the generators we’re going to look at later on are still quiet even when they’re running at full load. Please Note: Most inverter generators sit around the 60dB level mark, which is the same as a normal conversion. dB (or decibels) is the unit we use to measure noise levels. This is one area where traditional generators will always beat inverter generators, but it’s not a big deal when you’re going camping. The unit won’t be required to power every appliance in your house like you might need in an emergency situation. Please Note: The Starting watts is sometimes higher than the Running watts because certain appliances need a kick to get started, but it’s usually only bigger power tools. To find out if your generator can handle all of your appliances they shouldn’t be higher than the total wattage rating when added together. This one isn’t a big problem if you can dead-lift 315 pounds in the gym, but a lighter generator is always better than a heavier one. An emergency generator you store at home might not move a lot, but when you’re camping you want to be more flexible. If you have a heavy generator it could easily require the strength of two people to lift in and out of your car. A heavier one means it’s going to be bigger too, so if you don’t have a truck it could eat up a lot of space you’ll want for things like inflatable canoes and fishing equipment. Please Note: It’s also worth remembering a gallon of gasoline weighs around 6 pounds and a big generator will have a larger tank. You’ll also have to stock up on a certain amount of gasoline depending on the number of days you’re camping, which won’t be light if you are going on a long trip. A camping generator should be able to run for a long time. Even though an inverter generator will have a smaller tank, you don’t want it to run out too fast before it needs topped up. This is because you’ll want it to last throughout the night. There are a few appliances you could be running while you’re sleeping depending on things like whether it’s hot or cold. A longer run time also helps with the gas problem we talked about earlier on, because you won’t need to take as much with you for the weekend. We’ve talked about inverter generators a lot because campers seem to love them and this is a huge reason. They’re capable of producing ‘clean power’ that doesn’t jump around a lot compared to older generators. You don’t want to charge delicate laptops and smartphones on a generator where the output voltage jumps up and down continuously. It’s fine for power tools, but could easily fry the circuitry on fine electrical appliances. If you plan on spending time in any national parks throughout the US it’s vital your camping generator has a spark arrestor. It’s essentially a device added to your machine to prevent flammable debris from floating out of it when it’s running. Without one there is a chance your generator could be responsible for starting a huge forest fire that destroys everything in its path. If you’re in any national parks and get caught using a camping generator without a spark arrestor you’ll end up in big trouble. Bare in mind, you will need to do a little research before you go camping anywhere. Every individual campsite and other places you can pitch your tent will have their own rules you’ll have to follow. Maybe they’ll require your generator to have a spark arrestor too. It might have to be under a certain decibel level. There will likely be certain times of the day when you can’t switch it on if you’re surrounded by other people. This one is rather easy to explain and luckily it only applies to those living in California. There is a reason why it’s the most eco-friendly state in the US. You’ll only be allowed to use a camping generator if it’s CARB compliant. If it’s not, companies like Amazon won’t ship it to California. A true classic and one of the very best inverter generators available. Exceptional! ✓ View or download the MANUAL or the SPEC SHEET for the Yamaha EF2000iSv2. An Extremely Well-Designed Engine – It will come as know surprise to anyone Yamaha has once again delivered with their engine. Not only does the OHV engine have components making it efficient and reliable, but it can handle 13.3-16.7 amps at 120V and is rated at 1,600 Running watts. If you need the extra power the Starting watts tops out at 2,000. An auto warm-up and decompression system also helps the engine start easier, especially if you’re camping in a cold environment. Double your power instantly. Convenient and practical. The 1/4 Load Run Time Is Amazing – The engine tank only holds 1.1 gallons of fuel. You would normally expect the gas to burn up quick, but if you’re only running at a quarter load it’s capable of lasting up to 10.5 hours. This is easily enough to last you through the night. It lasts so long thanks to the Smart Throttle feature. It will work out how much load is being placed upon the engine and automatically bring down the reps per minute to increase things like fuel efficiency. It Will Hardly Make Any Noise – The Smart Throttle will also help bring down the noise of the Yamaha EF2000iSv2 camping generator, so the decibel level sits between 51.5dB and 61dB. Do you remember when we said that 60dB was about the noise level of an average conversation? Decibels work in a unique way, so 50dB would only be 50 percent as loud. At its quietest the generator is almost silent. We must not forget this is also aided by the rubber vibration isolation feet on the bottom of the machine. Only weighs 44.1 lbs which makes it easy to take with you. Small Enough To Carry Anywhere – You’ll never have to struggle carrying this generator because it only weighs a fraction over 44 pounds. It’s one of the lightest camping generators around, but it’s also one of the smallest packages coming in at around 2.2 cu ft. The measurements are roughly 19 x 11 x 18 inches. It’s a good job you’ll not struggle to carry it anywhere, because the spark arrestor will let you use it in every national park. It’s also EPA and CARB compliant. It Supplies Very Clean Power – It’s one of those camping generators you’d have no trouble plugging anything into because the power is clean. The voltage stability is so good it will only shift a single percent in either direction. Its frequency stability is just as good and will only move 0.1 HZ in either direction. You’ll have a couple of 120V AC outlets and a DC one to play with. If that isn’t enough safety for you it also has things like a Oil Watch Warning system. Great balance between portability, power and price. Easy to move around. Includes: Oil funnel, Spark plug socket, Wireless remote, 12V DC charging cables Battery, USB adapter (Automotive style 2.1A and 1A ports). It Has A Really Powerful Engine – For an inverter generator the engine under the hood of the Champion Power Equipment 75537i really does come packing. It has a 171cc Champion single cylinder 4-stroke OHV engine that hits impressive wattages. The Running watts is 2,800 and when you’re in need of an extra push you’ll have 3,100 Starting watts. Champion came out and said it even has the power to start and run a 13,500 BTU RV air conditioner if a tent isn’t glamorous enough for you. Well-thought out control layout and easy access for maintenance. The Generator Can Start Remotely – This feature is something you don’t see every day, which is a shame because it’s perfect for a camping generator. If you don’t want to hear any noise at all you’ll probably keep the generator as far away from the campsite as possible. With the Champion Power Equipment 75537i you’ll be able to keep it 80 feet away and still control it with a remote. You’ll love it at night if you want to switch it off without getting up. The Touch Start feature lets you turn it on by pressing a single button too. It’s A Surprising Quiet Unit – Even though the 75537i isn’t as quiet as the last model we looked at, you’ve still got to give it credit. The Running watts is nearly 2,000 higher and it only comes in at 58dB, which is measured from 23 feet away. Thanks to the remote control it’s going to end up a lot quieter. When it’s on Economy Mode the engine will bring down the power until it’s using exactly what is needed, so you won’t have to keep it 80 feet away if you don’t want to. Easy For Anyone To Move Around – The only real trouble a few people might have is lifting the camping generator out of the car, because once it’s on the ground it will be a breeze to move around. It has an integrated mobility kit with wheels if you’re on your own. Can run all night long at 25% load. Your camping neighbors will be jealous. If there are two people it has carrying handles to split the weight in half, which is good if you’re near rough terrain. The 95 pound machine is CARB compliant and comes with a spark arrestor making it fine to carry around anywhere in the country. Clean Energy From Multiple Outlets – If your Champion Power Equipment generator is running on its max load you’re still going to see less than 3 percent total harmonic distortion. In other words, don’t be afraid to plug anything into this machine. There are AC, DC, and even USB outlets where you’ll be able to plug things in. It runs for 8 hours on a quarter load, so you’ll be able to charge things through the night. Nice safety features like the automatic low oil shut-off sensor will let you sleep like a baby. Very affordable considering the level of quality from Westinghouse. A Great Power To Weight Ratio – This inverter generator gives you the best of both worlds if you compare it to the last two. Even though it’s light you’ll still get a lot of power from the 79cc Westinghouse 4-stroke engine. Has 2 USB Ports that can charge your electrical device. Quiet & lightweight. The Running watts is a respectable 2,100, with the Starting watts sitting slightly higher at 2,400. The High Efficiency run mode adds to the appeal of the WH2400i because it can reduce the rpm based on the power it actually needs to function. Lightweight And Well-Designed – Let’s focus more of our attention on the weight for a minute, because it’s a huge part of what makes the WH2400i so great. At only 43 pounds it’s lighter than anything we’ve looked at so far, yet it’s not the least powerful machine. It’s also ergonomically-designed and when you carry it around you’ll feel like you’re holding a briefcase. While we’re on the subject of taking it places, it has a spark arrestor plus it’s EPA and CARB compliant. So Quiet It’s Hard To Hear – The Westinghouse WH2400i sits at 59dB, which doesn’t look too impressive until you take a closer look at it. Instead of the usual quarter load this is how loud your camping generator will be when it’s running at half load. It’s not too often you’ll get that high while camping. The machine has a dual muffler design, a double insulated acoustic hood, and asymmetrical fans. All of these additional features help the WH2400i remain quieter than the background of a coffee shop in some instances. This model does not have USB ports. Read our full review. This Thing Runs All Night Long – Even though the last camping generator we looked at was powerful the run time didn’t live up to expectations. You couldn’t lie in your tent with power running for a few hours when you woke up in the morning. The WH2400i adds hours to the run time while still offering extra power, and in the end it works out to around 11 hours at 25 percent load. Like other inverter generators you can double them up to boost both power and run time using a simple cord. Built In Safety Features – The first one is the most obvious, which is the low total harmonic distortion. Like the last model this also sits at less than 3 percent, so you’ll have no trouble hooking electronics up to your AC, DC, and USB outlets. A low oil shutdown feature switches your campsite generator off when the oil levels drop too low without you noticing. You’ll get an AC overload reset too, which will increase your safety as well as preserving the life of the machine. If you want to learn more, we recommend reading our comprehensive review on the Westinghouse WH2400i. Powered by gas or propane gives you greater flexibility for generating power. ✓ View or download the MANUAL for the Champion Power Equipment 100263. Two Different Sources Of Fuel – Dual fuel generators are hugely popular for emergencies because they can run off both gasoline and propane. It’s easy to see why they’d be great for camping too. You can fill up your canister at a gas station, but it’s easier and safer to transport tanks of gas. Propane also works out a lot cheaper to buy. If you’re not a regular camper you’ll also be able to take the same tank more than once because they’ll last until all the gas is gone even if it’s years. High Running And Starting Watts – We established how powerful Champion Power Equipment engines were earlier on, and this model won’t disappoint you no matter what type of fuel you choose to use. Gas is obviously slightly higher, so you’ll get 3,100 Running watts and 3,400 Starting watts. If you opt for propane you can expect 2,790 Running watts and 3,060 Starting watts. The slight lack of power is a small price to pay for having two fuel sources available, because it will give you so much flexibility in the wild when things can go wrong. The Decibel Level Is Respectable – If you stand 23 feet away from the dual fuel camping generator it’s rated at 59dB. This isn’t the quietest we’ve seen so far today, but it’s great for a powerful engine and still not officially as loud as a conversation. Like the other models so far this inverter generator has an Economy Mode, so it will be able to self-regulate when it comes to how much power it needs. Along with prolonging its life and saving fuel, it’s another way it can remain so quiet. The large wheels make it easy to move around. A Big Difference In Run Time – The biggest difference out of all the dual fuel features is the run time, but can you guess which one is better? If you’re using gasoline a full 1.6 gallon tank of gas will last you around 7.5 hours on a 25 percent load. Once you grab your propane quick connect hose it nearly doubles. At 25 percent load, a 20 pound propane tank will last you around 14.5 hours. In an ideal world you’d take both fuel sources camping in case something happened to one of them. Top Quality Safety Features – We’ve already spoken about the pure sine wave many times, so we’ll talk about another few safety features soon. It still needs to be noted the 100263 is great for delicate electrical appliances and the total harmonic distortion is less than 3 percent. The Champion Power Equipment 100263 has a spark arrestor plus it’s EPA and CARB compliant, so it’s safe for the environment. The generator is heavier than usual, so it has an integrated mobility kit and carrying handles to help you move it. You’ve also got standard things like a low oil shut-off sensor. Designed for: camping, construction sites, tailgating and power outages. A Reliable And Small Engine – The WEN 56200i might be the smallest engine we’ve looked at today, but it’s definitely well-built and will last you a long time. Upon delivery you’ll get a 79.7cc 4-stroke engine with good enough power for a simple camping trip. The Running watts sits at 1,600 and Starting watts sits at 2,000. It does have the all important spark arrestor so you can use it camping in national parks, plus the generator is EPA and CARB compliant too. Quietest Generator You’ll Find – When the WEN 56200i is running at quarter load it will only reach 51dB, which is the same noise level as sitting in a quiet office. In other words, you would hear faint conversations but you wouldn’t be able to make out what they’re saying. This isn’t just because the engine will be running at a low speed. Even if it’s sitting at a higher load the decibel level will be brought down. The WEN Eco-Mode allows the motor to adjust the fuel load, which will always bring the noise down. 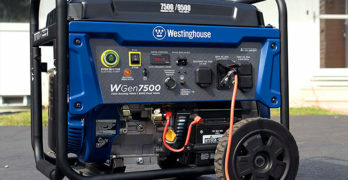 Important Safety Features – When you’re dealing with a camping generator that only has 2,000 Starting watts, it’s easy to load too many appliances into it accidentally. Instead of ruining the machine the Overload Protection feature will stop anything from frying. Along with the low oil shutdown we’ve looked at earlier on, the 56200i comes with low fuel automatic shutdown. The low total harmonic disruption level will also allow you to charge lots of sensitive electronic equipment in your tent. A Good Enough Run Time – Once you see the run time of the 56200i is only 6 hours it might put you off, but don’t forget this is when it’s running at half load. At least they’ve not copied other companies by trying to look good giving you run times at quarter load. If you’re only running a couple of things at night it will last until you wake up, plus we’ve already said it will shut off automatically instead of when the fuel disappears to help prolong its life. You can add two machines in parallel if you do need the extra run time. Enough Outlets For Everything – It seems even the least powerful camping generator of the bunch still has enough outlets to plug everything in. On smaller inverter generators there isn’t as many outlets, but you won’t need to plug in all your appliances at the same time anyway. The WEN 57200i has enough space for all sorts of appliances. You will get a couple of three-prong 120V outlets, a 10V DC outlet, and a USB port. They’re right next to each other on the easy-to-use control panel. Quieter than a traditional camping generator. Can power an RV air conditioner. LCD StatStation Display For Power – First of all, it’s not likely you’ll overload the P3000 PowerSmart inverter generator because it’s pretty powerful. The Running watts is 2,600 and the Starting watts goes all the way up to 3,000. That doesn’t mean Briggs and Stratton won’t add a feature to make things easier on you. They have an LCD StatStation display on the unit telling you exactly how much power you’re drawing from the appliances you’ve already got hooked up to the camping generator. It’s Simple To Move From A To B – Even though the generator is extremely light (60 pounds), Briggs and Stratton still went out of their way to design it for moving from A to B with ease. The most basic thing is the handles two people can use to lift it out of a trunk. It has a telescoping handle you’ll be able to pull out, which will let you maneuver the camping generator around like you’re rushing through an airport. There are also 6-inch wheels on the bottom of the unit that can’t go flat, so you’ll be able to yank it through any rough terrain. Purchase the parallel kit: P3000 + P2200 + Parallel Cable. Excellent value! Lots Of Extra Outlets Available – On the last model we looked at the outlets available on the smallest camping generator, so let’s look at what you’ll be getting on one of the more advanced. Hint: it’s enough to power your entire campsite. Altogether you’ll have four standard 120V household outlets, one 120V 30A outlet, one 12V DC charging outlet, and a single USB port. The inverter technology with less than 3 percent total harmonic distribution will let you plug in any sensitive electrical appliance. You’ll Get A Great Run Time – The total capacity of the tank is only 1.5 gallons and its 171cc engine is powerful, yet it’s still able to last around 10 hours on a quarter load. As always, it helps when the engine speed is able to slow itself down automatically. There is also the bonus of getting 10 hours of runtime within national parks, because the P3000 PowerSmart series generators do come with a spark arrestor. Unfortunately, this model is not CARB compliant therefore banned everywhere in California. Warning You Of Any Problems – This model does have low oil shutdown to safeguard the longevity of your camp generator, but it also warns you of other problems perhaps not so series. For instance, the fuel gauge will tell you when it’s time to top up. It will remind you when it’s time to change things like the oil, air filter, and the spark plugs. If you’re going to get the generator serviced after you’ve used it for a certain number of hours you’ll have a display giving you an hour figure too. We’ve covered quite a few camping generators today, so you’re probably wondering which one is the right choice for you? As long as you choose an inverter generator it doesn’t really matter. The ideal one is the generator that stood out the most to you. There must have been something special about it you liked. If you want to know the best way to choose one it’s actually quite simple. Spend around 20 minutes doing a little research, but not on the other generator features. Read through the unbiased reviews on Amazon, because if hundreds of people are telling you something is great it’s likely to be true.